In this blog I will show you how to inject your Windows 10 start menu offline so that on first boot its already configured in your reference image or even your deployment task sequence whether that be MDT of ConfigMgr (SCCM). Your welcome to also download the DefaultStart.xml and or just rename your default start menu XML to “DefaultStart.xml” and add it also to the deployment share “Scripts” folder. Then open up your chosen Task Sequence in MDT and just before the “Inject Drivers” step under the “Post Install Group” and a new “Run Commmand Line Step”. Powershell.exe -ExecutionPolicy Bypass -File "%SCRIPTROOT%\Action-OSD_InjectStartMenu_Offline.ps1"
For SCCM you must be using the MDT integration (if you’re not… Start now! ), you can make it work without it but I will not cover that here. 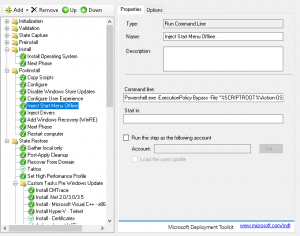 Find your current MDT Toolkit Package that is associated with the Task Sequence you would like to configure power settings in. Open the “Source” location of your toolkit package, then open the scripts folder. Once inside the scripts folder copy the “Action-OSD_InjectStartMenu_Offline.ps1” into it. And then your welcome to also download the DefaultStart.xml or just rename your default start menu XML to “DefaultStart.xml” and add it also to the ToolKit Package “Scripts” foldera also. Now, update the Package in ConfigMgr. Create a new “Run Command Line Step” and the below command. Powershell.exe -ExecutionPolicy Bypass -File "%DEPLOYROOT%\Action-OSD_InjectStartMenu_Offline.ps1"
And that is it. 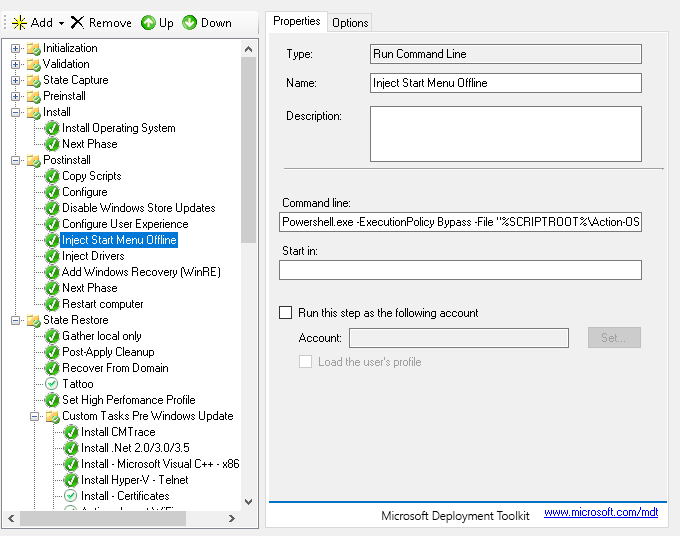 Your ConfigMgr or MDT Task sequence is now setup to inject the default start menu before the machine boots! Anyway as always, script is provided as is and if you do mod it, there is a line to add your name.